Beautiful Surprise Home!! - Incredible home is now available in desirable Surprise! Featuring 3 bed, den, 2 bath, 2 car garage, gravel front & back landscaping, den great for an office, and neutral paint tones throughout the entire house. No neighbors immediately behind nor in front as there is a greenbelt area. You will absolutely love this well maintained kitchen complete with ample cabinetry, centered island with breakfast bar, recessed lighting, and upgraded stainless steel appliances. Impeccable master suite includes a lavish full bath and walk-in closet. Perfect sized backyard offers a covered patio and sitting area great for relaxing afternoons! Dont miss out on this great opportunity. Schedule your showing NOW! Single Family - Detached - Anthem, AZ - Single family home located in the desired community of Anthem. This home is walking distance to the community parks, catch and release lake and shopping. Home has 3 bedroom, 2.5 baths and a kitchen that opens to the great room. Nearly maintenance free as the HOA takes care of the front yard and community landscaping. come see what this great home has to offer, schedule an appointment today. Remodeled Mesa Home - Completely remodeled home on huge lot. Irrigated back yard. Brand new Kitchen and bathrooms. New flooring throughout. Roof and AC are only 3-5 years old. Located close to ASU, Downtown Mesa, Riverview Cubs stadium, Tempe Town Lake and close to 101 and 202. Single Family - Detached - Surprise, AZ - Beautiful Move In Ready Home in Marley Park. This home features 5 Bedrooms, 4.5 Bathrooms, a Living Room (currently a movie room), Dining Room, oversized kitchen with island and quartz countertops! Upstairs you have 4 bedrooms with a loft. The master suite also features a very spacious master bath with a large walk in closet. This home also has it's own private casita with full bath, Solar, 3 car garage and a large green backyard with paver patio. Finally this home is located in Marley Park, so you have a community pool and recreation center! Call your Broker today to schedule a private showing! Desert Hills Custom Home on 1 acre - Beautiful, warm and inviting home with open floor plan. Kitchen features granite counters and upgraded stainless appliances. Travertine tile thru-out except bedrooms. Backyard boasts a large pool with mature landscaping, large patio for entertaining or just relaxing. Complete RV hookup. Lots of room for horses, toys, guesthouse or shop. Take advantage of not having those huge summer APS bills with this home being on solar. Very private and quiet with outstanding mountain views. There is a custom made safety net that goes over the top of the pool, to keep all little ones safe. 640 Acre Mountain RANCH ~ Mohave County - - 640 Acre Mountain Ranch in the Aquarius Mountains in Mohave County Arizona. Ranch features 1 full section of private deeded property. Ranch Home is situated on a ridge over looking high desert mountain and canyon vistas. Property is move in ready with own power, gas and water services. Furnishings are available on a separate bill of sale. Property would make a great mountain retreat for hunters, ranchers, artists or anyone who is looking for a private estate at 4000 plus feet above sea level. Property features abundant wildlife and seclusion from civilization, Located approximately 3.5 hours from Phoenix and 3 hours from Las Vegas, Nevada. Tours are available for qualified clients. Call your Broker for more details. Desert Hills Dream Home on 2+ acres - BACK ON THE MARKET. 2.3 acres in The Great Open space of Desert Hills. This home and all the additional buildings are solid block built homes which adds great insulation to the house. The home is situated in its own court yard encased settings. You enter through the gates on west side and come in court yard and the covered patio to the West which offers a place to sit back and enjoy the open space of this great home. Once inside you will find the kitchen inviting and open with granite counters and 42'' cabinets and propane cooktop. The master and one additional bedroom each with it own bathroom. The laundry it located in the hall right next to the bedrooms for easy access. WOW...Outside a stand alone solid block 3 car garage with tons of space and a 1600 ft block Shop. The shop is set up with copper air line and compressor around all sides. A 125 amp sub panel just for the shop. 220v outlets and 110 around the walls. Full lighting and all kinds of space to work on any projects. The 2 way shared well has a dedicated pump for a 2" water line that runs the perimeter of the lot. All the appliances come with the home, plus the air compressor in the shop, the washer and dryer, and the buried propane tank. All items will transfer as -is with no warranty or guarantee from the seller. 2+ Acre Horse Property in Desert Hills - Beautiful fully fenced horse property on 2.3+ acres in Desert Hills! Nice flat lot - with 6 stall shed row barn, 3 turnouts, 60' welded round pen, hay barn + room for much more on this fully cleared lot ready and waiting! Close to state land for riding and hiking pleasure! Western styled ranch home with GORGEOUS AZ room, wood ceilings in bonus/family rm that current owner used for his HUGE Master Bedroom, brick wall in LR and Kit and brick fireplace in Living room with electric heat blower insert that heats the whole house if you wish! Western touches throughout give this home that special touch that you don't want to miss! 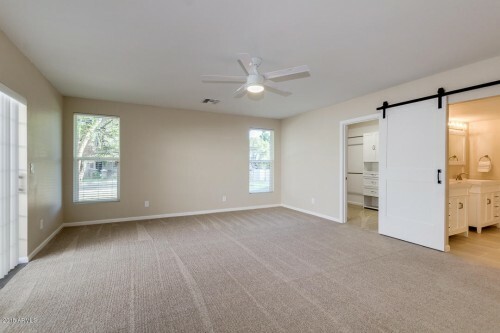 Detached storage room with covered parking areas for your TOYS! City water, private setting and gorgeous mtn views! This home won't last long at this great price!! Single Family - Detached - Phoenix, AZ - Breath Taking! This completely remodeled home is bright and spacious with a modern open floor plan. The house features a large family room along with flowing kitchen and dining areas. The kitchen boasts new cabinets with ample storage, stainless steel appliances and marble countertops. The large master bedroom suite features a walk-in closet and private patio. The master bath has a large walk-in shower and private toilet. The two additional nice size bedrooms include one with a private bath. The landscaped backyard has a resurfaced pool with refurbished pool equipment, pergola and low maintenance grass. Other new upgrades include a service panel, water heater, and windows/doors throughout. The home also has an updated heating and cooling system. A must see.